I've gotten the impression that some people think that half of the people in California are in the process of packing up their lives in order to move over to Texas. I'm not sure if this is really a wide spread notion or if its just something a few people think. I can understand the concept that people would be compelled to move from high cost, high tax California over to lower cost, lower tax and relatively booming economy of Texas. (Setting other preferences aside). But the fact of the matter is that there isn't really any kind of significant rush of people in a reverse Joad phenomenon flowing out of California to Texas. People ARE indeed moving out of California every year and more people move from California to other states than move from other states to California. Many people are moving into Texas and in fact Texas was the state with the highest number of people who moved there from other states with 514,726 new arrivals from other states in 2011. However those 514,726 new arrivals from other states account for only 2% of the population in Texas. Oh, and by the way California is the #3 destination after Florida with 468,428 people moving there from other states. But wait while you do have a lot of people moving into TX, CA and FL you also at the same time have a lot of people simultaneously moving out of each state. 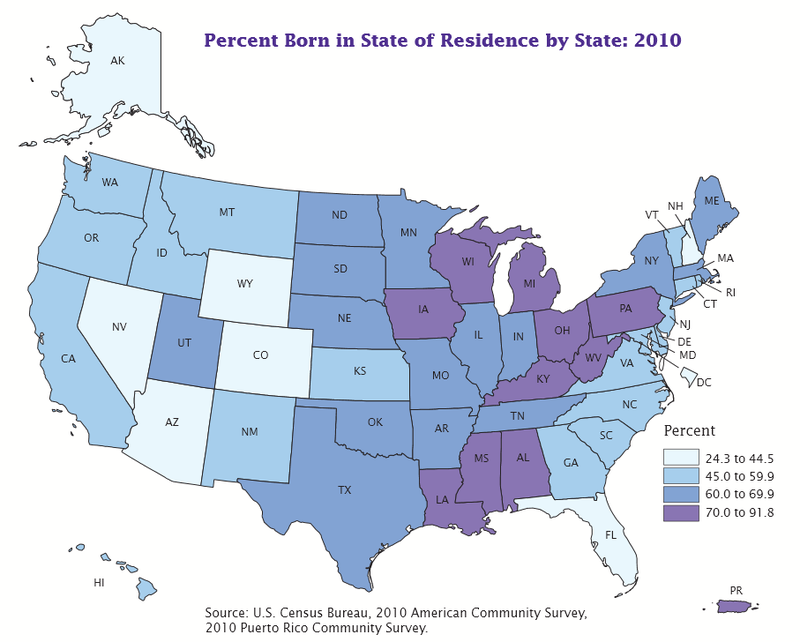 The real question is what is the total net migration to a state from other states? First lets look at the state to state movements for 2011. I got the State to state migration flows from the Census which shows the number of people that moved from each state to each state for a year. Relative to their large populations the +0.4% inflow into Texas and the -0.3% outflow from California aren't what I'd call any kind of 'exodus' either direction. Many other states see much larger percentage migrations in or out. You might have heard about the boom in North Dakota due to the growing oil industry there. I would guess that accounts for N.D. being #1 on the list with the highest % population growth due to influx from other states. Look at that whopping 7.6% net outflow from Alaska to other states. Now thats what I'd call an 'exodus'. Poor Alaska... nobody wants to live in the cold. Looking at it that way we do see that Texas gained the most people of any state and California lost the 2nd most. All the numbers above are just state to state migration. At the same time we also have people moving into and out of each state from or to foreign countries. If you consider foreign migration it changes the picture considerably. Lets look at the change in population if we include the foreign immigration. Interesting California jumps all the way from 2nd to last up to 3rd. Again, poor Alaska is rock bottom as apparently not even hardy foreigners want to move to the frigid North. One point of interest is that if you include the foreign migration all but 6 states have positive numbers. The above numbers are all just for the year 2011 so that is just a one year trend. Another way to look at things is to measure the percentage of a states population which is born in other states or foreign born. That gives us an idea of how many people have moved into the state in question (and stayed) over the long term. Now as you can see theres pretty wide variations there. Lifetime Mobility in the United States : 2010 which is the source for the graphic image that is in the insert above. Magnet or Sticky? : A State-by-State Typology from the Pew Research Center which looks at figures for 2005-2007.